I have noticed lately how surprised many people are (and they tell me so) when I talk about canning different food items. Most of the questions and astonishment comes by private messages or emails with the writer starting out with something like “I didn’t want to ask out in the open because …” This makes me sort of sad. Let me tell you why. In the age of promoting women to get out of the house, go to work, have a career, raise your kids, be busy to the point you can’t breath and feel like you are going to fly off the earth, buy it pre-made, prepackaged, preprocessed we have let ourselves become uneducated in the home arts. Keeping a home and providing meals should not be drudgery and slugged through as if walking through mud. There is an art and a science to keeping your home and providing materially with comforts and food. It is knowledge that has been lost to so many. I always find myself ‘surprised’ if not shocked when I am told by people they don’t know how to clean something or they have no clue how to prepare something. Even when I go to the store and purchase several cases of canning jars the reaction throughout the store by employees and other shoppers is eye opening to say the least. I love sharing my knowledge with others but I find most often many people think it is far too complicated to be able to preserve food in a canning jar. I am a Christian. I am a fundamentalist. I am conservative. My faith is deep and has always been a part of my life for as along as I can remember. I don’t have to question it but I could if I wanted to and I know where to find my answers. I know I can trust in it for it has never failed me. I have faith ever-so-much more than a mustard seed. Over the last few years I have been inspired and convicted by a passage in the Bible. It is God’s portrait of a woman. A beautiful woman. I want to be this woman. I fail daily but I keep trying. Though I may never succeed I do my best to be her. I am copying the verses here for you to read in full context. A very hard standard to try and live up to, isn’t it? She is like the merchants’ ships; she bringeth her food from afar. She riseth also while it is yet night, and giveth meat to her household, and a portion to her maidens. She considereth a field, and buyeth it: with the fruit of her hands she planteth a vineyard. She looketh well to the ways of her household, and eateth not the bread of idleness. It is a commandment to be wise with the food stores we are provided with. Make use of and be wise in sowing and harvesting and preserving. Don’t waste. Be diligent. Share your bounty with your family and with others who are less fortunate. So when people ask me why I can so much I typically answer that I can seasonal foods for times when they are not available fresh locally. It’s how we eat in the winter months. Most have stopped listening when I say I feel convicted to make use of what is provided to be stored away for later not just for us but others who might be in need. When I updated my status on Facebook last night to say I was canning milk the messages and emails flooded in with questions asking why or how and nearly everyone said, “I did not know you could can milk”. We have lost out knowledge and skills in home arts. With a few simple pieces of equipment we can safely can and preserve almost everything in our kitchen and not have to rely on electricity to keep a freezer and a refrigerator cold to preserve our foods. With a little effort they can sit in the pantry and need no special care right up to the time we take them down to use them. When it comes to highly perishable food items like dairy products we don’t have much we can do to keep to keep them for extended periods of time. Milk can be made into cheese and cultured in to sour cream, buttermilk, yogurt and the like but even those things have a very limited shelf life. You can freeze milk but it does separate and sometimes will be a little chunky when it thaws where the milk solids are broken down. You can freeze blocks of cheese but when you thaw them it breaks down into curds. Yogurt, sour cream, cream cheese and the like loose their creamy texture when frozen. It can be done but just isn’t always the result we want or expect. I believe in the value of raw milk. My kids drink no other milk. It is fresh from jersey cows and our dairy goats. When it is heated the good properties are lost. I know this and I stress this. However, there is no way to make cream of chicken, cream of mushroom, clam chowder, cream of broccoli, cream of tomato, cream of any number of things without cooking the milk. This is a given. During times of the year when dairy animals are in milk we often find ourselves ‘drowning’ in milk. Milk is everywhere. You can’t drink enough, cook with it enough, make enough dairy products or breads to keep up with the production. In most states you can’t even give it away based on the laws governing dairy products and consumers. Other animals are usually happy to get their share of the milk but without a pig or three you will still find yourself drowning with an over flow of milk. If you have a pressure canner, sterile jars and a little time you can preserve that milk. It cooks in the jars and has a stable shelf life. You can use it later as the base for soups, gravy, baking and what not. It won’t be good to serve cold with cereal but it will be fabulous in other cooking needs. It is recommended that when cooking with milk that has been pressure canned that the contents boil for a minimum of 15 minutes in a cooking process. 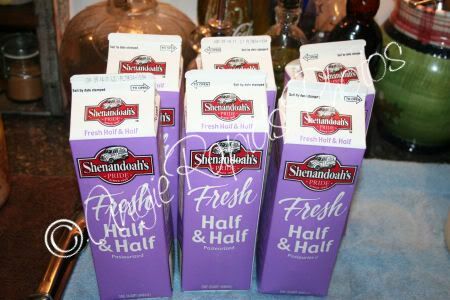 This past week a friend shared with me some half and half she had in her freezer. 30 quarts I believe is what she had stored. She needed room in her freezer for other things as well as she had fresh milk in her fridge to make cheese with in equally large portions. So, what to do with it? When it freezes it separates. So, it wouldn’t be great for cheese making or pouring over your cereal or into your coffee. We decided to can it to use later when milk is lacking in the dry season. I sent all the jars and utensils through the dishwasher on the sterilize cycle. I filled the pressure canner with appropriate amount of water and set it to simmer. You can only can milk using a pressure canner. Do NOT ever attempt to preserve low acid foods (milk, meat, vegetables, etc) in a water bath canner. You cannot get those foods hot enough to kill the bacteria spores that are common in the air and on every surface around us to kill the bacteria that causes botulism – food poisoning. It can be fatal. 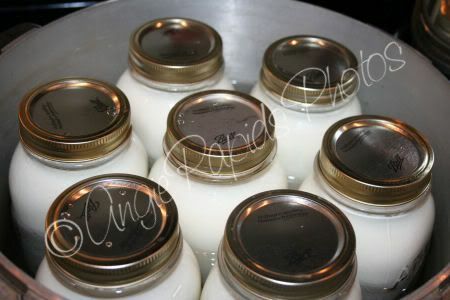 There is much controversy surrounding the home canning of milk. There are many instructions to be found for a WB process but that frightens me to the very core. I would never eat anything with a waterbath canned milk. NEVER. ONLY use a PRESSURE canner to can milk like you see here in these photos. Start with clean, sterile jars and equipment. I run everything through the dishwasher. I start water simmering in my canner. I put my jars in the canner and keep them hot until I need to fill them. Fill the jars one at a time with the milk leaving one inch head space. Apply hot lids and rings. Return each jar to the canner to keep hot while you work. And soon all your jars will be filled and ready to process. Put the lid on the canner and allow the steam to vent freely for a full 10 minutes. 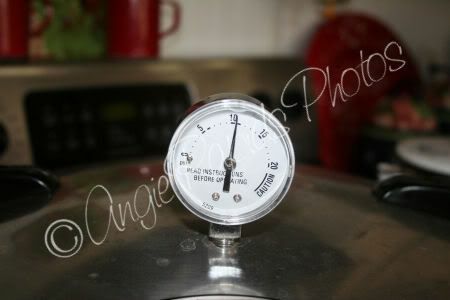 Apply the weighted pressure regulator and being the pressure up to 10lbs and process for 25 minutes. Once the pressure has reduced and the canner is opened move the jars to a thick layer of toweling too cool. You will hear the ping of the lids as they seal. If your lids do not seal, replace them with new ones and process again. The milk takes on a caramel coloring. It is cooked milk. It is preserved and can sit on your pantry shelf for up to one year. Use as needed in soup bases, sauces, gravy, etc. It is not hard. You can safely do these things in your own kitchen. Follow the rules of cleanliness, safety and sanitary precautions. Process the food items at the proper levels for the proper length of time. It is safe – more safe than in our grandmother’s day. Don’t be overwhelmed. You don’t have to process 5 bushels of fruit at one time. I work with 7 quarts a time. 7 quart jars fit in my canner. There is much discord (controversy!) about canning milk at home. The USDA indicates it is unsafe and all directions for processing milk and milk products have been removed from all of their literature. This is something you have to decide for yourself and weigh the pros and cons. Here is an article from Mother Earth News and one from Razor Family Farms. There are two tidbits here in the Ask Jackie section of BackwoodsHome. I stopped here because I was looking for a way to can my home made “milk syrup,” otherwise known as sweetened condensed milk. So glad your info is thorough and well rounded. I have a huge old pressure cooker/canner that was my grandmother’s. If I could ever get it and all its bits and bobs together at once, I could really go to town! One idea for the canned milk — a lot of polenta/corn meal recipes call for canned milk, and it really does make a rich, creamy tasting dish. So, there’s another use for your home canned milk. Also, the one good thing about supermarket milk — ultra pasteurized and homogenized — is that you can freeze it without problems. I found myself with six gallons of milk and no plans to make cheese or anything else to use it up. I stuck several gallons in the freezer, and when I got them out to thaw in the fridge, they looked and tasted just like “fresh” and worked fine for my iced lattes, tea, mashed potatoes, really anything I usually use milk for. I was wondering if I could use canned evaporated milk (from the store) in my creamy soup recipes that I want to pressure can for my pantry. I have read that you shouldn’t use milk in any soup that will be canned because the pressure cooking process does not penetrate the fat in the milk enough to safely kill botchulism (and my soups usually have meat in them). I was just wondering if the canned evaporated milk, since it was already processed, would be an alternative. I would love to hear you thoughts on this. I love your proverbs 31 wife addition. I am from the same mindset mold and enjoy all of life very much. The feeling of accomplishment is fulfilling to say the least. thank you for the milk info, I will be using it shortly. It is nice to know you can store up nearly everything in canning jars for a possible time much harder than what this world is used to. waste not, want not. I am new to the canning world and I am trying to learn how to can my homemade soups and stews. I have a huge problem for two reasons. 1. They say not to puree your vegetables but I puree potatoes to use as a base/thickener instead of flower. 2. I use milk as part of my base. Is it still possible to can these soups/stews? I just found your site and I LOVE IT!!!! A couple of questions, 1) Can I can evaporated and sweetened condensed milks in the same manner? 2)If so what are the times and pressures? I also have a comment: While I understand peoples concerns over home processing foods because of government guidelines, I would like to point out that these methods are what our ancestors used to get through the winters and bad harvests, and we are all here today because they did. When canning began making a comeback in the 30s and 40s because of rationing is when the government started issuing such stringent guidelines, as commercial food production has increased, those guidelines have gotten much stricter. Many people believe as I do that these uber strict guidelines are less about our actual safety and more about the profits of commercial food producers, it is highly possible that eventually those guidelines will tell us that the only SAFE food is commercially processed and store bought. For those who take issue with canning certain foods, don’t do it; but for those of us who feel we can do so safely and feed our families by doing so, we should be able to. I was wondering how long a shelf life is for canned milk? It should be used up within a year. I have been canning for years and now have access to fresh cows milk and I was looking for canning advice on it. I also want to make sweetened condensed milk and can that if possible. Any advice will be greatly appreciated. I will definaty be coming back to this site. take a look at this amazing website, give’s FREE simple Weight-Loss tips that actually work! ,ACNE treatments, Beauty tips and many more! http://healthylive.me/ Go check it out now you won’t regret it! 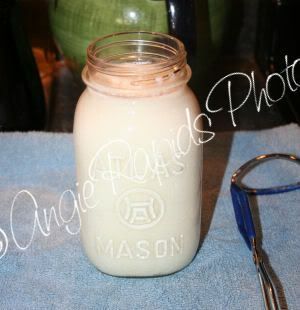 So, has anyone tried canning sweetened condensed milk? I would assume it would require at least the same amount of time and pressure as canning milk? Thank you for this post on canning milk since I am a novice canner and wondering if I can buy canned milk then why can’t I can it at home in a pressure canner? Yet with the risk of a nasty botulism spores (which I do not believe is killed by pasteurization) springing to life with me heating the milk and placing it on a shelf makes me really hesitant to do this. Since from what I have read the fat in milk protects the botulism spore from being killed by the heat. I’m new to canning and was wondering. I have an amazing recipe for earl grey milk jam (earl grey sweetened condensed milk essentially) and was wondering if it possible to preserve some after it’s made by canning it. Every time I make it I can never seem to use it fast enough and would really love to just be able to save some or even make it and give it as a gift if it can be canned. I’m wondering if this process would work with a store bought milk or cream to make a chai tea concentrate. I found a recipe I’d like to try it with but it obviously doesn’t keep any longer than the milk normally would. Since I thought this would make a great gift for friends, I’d like it to last a little bit longer. There certainly is a plethora of dairy rich canned products in the grocery stores. From actual canned milks (cow as well as goat) to rich chowders, and white sauces. I see it in both glass and metal cans. Wonder what USDA says about that? I wonder what the USDA recommendations were for canning dairy products and other fat rich foods – before they removed them from their literature. Does anyone have the old instructions? I’m not keen on skimming the fat off my chicken broth. Does the milk need to be heated before being placing in the jars? Or just poured from it’s orginal container into the canning jars. Weather it’s from the store or your own cows! There were a lot of good questions asked, where will you post your answers? Thank you for all that you do and for your faith. Found you -again! I tried this out last year. I didn’t make enough! lol! I used a friend’s cooker last year. I used my pressure canner for the first time this week -alone. It is scares me, but the Lord helped me. 🙂 I am going to tackle milk next. I kept putting off milking and letting the “babies” get it all. But now that I have printed your information off, it is time to wean those babies. Thanks ever so much for your insight and sharing Proverbs 31. It is nice to find sister and like minded people. I always found it odd that milk wasn’t on the list of things to be canned. It really can’t be that the fat in milk is protecting botulism spores. And it can’t be the thickness. I have canned in my pressure canner chilli con carne and as long as I gave it enough head space the hot fat didn’t interfere with the seal. You can can soups, stews and chilis as long as you cook for the maximum time for the ingredient that will take the longest. Fatter foods can be canned and thicker things can be canned so why do they claim milk can’t be(whole milk has a fat content between 3-4%)? Be safe, be clean, and when in doubt throw it out. Botulism is odorless and tasteless however it does emit gas as it consumes food so lids will unseal. I usually take off the jar rings when the cans are completely cooled. The thing with botulism is that it needs dark, wet, and a base ph to grow in. 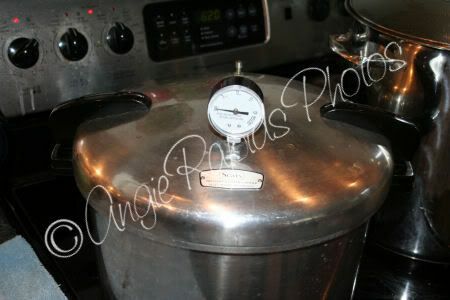 That is why it is so important when dealing with canning to use a pressure canner for the base foods. Knowing this I still feel its safe to can milk. 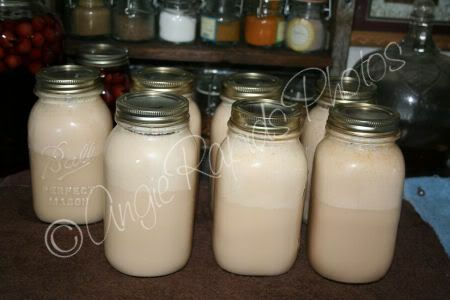 I have a glut of goat milk and eggs I need to put up. Is there anyway to can homemade pudding? I know I could can my milk and oil my eggs and make it later, but kinda want it stored as an instant food for the shelf. May God bless you in all that you do, carry on sister! I’ve canned for years, and this post intrigues me. Gonna try it just for the fun. Canning is actually a hobby of mine. I truly enjoy it. This was a marvelous post. God Bless You. Hey, i have enjoyed reading your article about canning milk. I tried this for the first time last year. 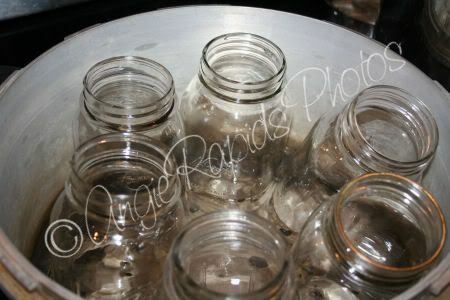 I just cleaned my pantry to get ready for this canning season and found that a couple of my jars are thick and separated…they are completely sealed and seem fine other wise. I wanted a second opinion about why this happened. Do you think they would be safe for consumption?? Years ago when New York had a milk strike, I canned bunches of fresh milk. My baby girl is 43 and still alive and healthy. Now I’m constantly running out of 1/2&1/2 for my morning coffee. My pressure canner holds 14 pints. I should be good for about 3 months! Please let me know if you’re looking for a author for your weblog. You have some really good articles and I feel I would be a good asset. If you ever want to take some of the load off, I’d absolutely love to write some articles for your blog in exchange for a link back to mine. Please shoot me an e-mail if interested. Thanks! Please let me know if you’re looking for a writer for your blog. You have some really great articles and I feel I would be a good asset. If you ever want to take some of the load off, I’d love to write some articles for your blog in exchange for a link back to mine. Please send me an e-mail if interested. Thank you! I do love the manner in which you have framed this specific problem and it does offer me a lot of fodder for thought. Nonetheless, through what I have personally seen, I really wish as other feedback pack on that men and women continue to be on point and in no way embark upon a tirade regarding the news du jour. Anyway, thank you for this superb point and whilst I do not concur with the idea in totality, I respect the point of view. Hello there! Quick question that’s completely off topic. Do you know how to make your site mobile friendly? My blog looks weird when browsing from my iphone. I’m trying to find a template or plugin that might be able to resolve this problem. If you have any suggestions, please share. Thank you! Thanks for the marvelous posting! I actually enjoyed reading it, you are a great author.I will always bookmark your blog and will come back later in life. I want to encourage you continue your great job, have a nice weekend! I see no answers to the questions that have been posted going back to the first one in 2012. Have I missed them. The root of your writing whilst sounding agreeable at first, did not settle properly with me after some time. Somewhere throughout the paragraphs you actually were able to make me a believer unfortunately only for a while. I nevertheless have got a problem with your jumps in logic and you would do well to fill in all those gaps. In the event that you actually can accomplish that, I could certainly be fascinated. Thank you for another wonderful post. The place else could anyone get that kind of info in such a perfect means of writing? I’ve a presentation next week, and I am on the search for such information. I bought 3 awesome outfits online for less than $99! I purchased 5 awesome outfits online for less than $60! Thanks a lot for sharing this with all people you actually realize what you’re speaking approximately! Bookmarked. Please also discuss with my website =). We will have a hyperlink change contract between us!